Cereals have been cultivated in the middle-east, where they originated, for over 10,000 years. They were domesticated from wild grasses that grew in the region, and whose seeds were harvested by early people. Wheat and barley reached Ireland with the megalithic farmers about 5000 years ago. Oats and rye evolved later, possibly from weeds growing i other cereal crops and became important in northern Europe as they are more tolerant of cool wet weather. Sow cereals for seed in September or October or in March or April, in rows 30cm apart. If they are being grown as a green manure they can be broadcast at a rate of about 25g/sqm. If possible protect form birds after sowing, with a net. Keep well weeded by hoeing between the rows. Cereals can be used green for tea and grass, as well as mature and dried. For tea, harvest when the seeds exude a white milk when pressed under a nail. The main crop should be harvested when the plants have turned brown and the seeds are no longer milky, or when the birds start to eat them. The plants should then be harvested by cutting them at the base, bundling them into sheaves and drying under cover. They can be threshed by running through a garden shredder, although this damages the seeds a bit or by banging the plants on the edge of a bucket or barrel. They then need to be winnowed in a stff breeze to remove the debris. Oats need to be dehulled, steamed and rolled to make the familiar flaked oats used for porridge. Hulless oats may be simply soaked and boiled to make porridge or ground into flour. Wheat and rye can be ground into flour. Oat Sonas, Avena sativa A tall Irish heritage variety. Average 300 seeds/ packet. Spelt Triticum spelta An ancient hexaploid species of hulled wheat possibly formed by the hybridisation of a tetraploid wheat such as emmer wheat and the wild goat-grass Aegilops tauschii or with bread wheat. 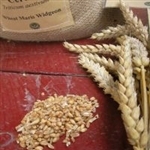 It has less gluten than modern wheats and is popular for specialty bread making. It can be grown like bread wheat and is bst sown in autumn. The hulls can be threshed off in a garden shredder, although this damages the grain slightly. Triticum aestivum A spring variety. It came from Michael Micklas. It grows very well and is nice and tall. Average 200 seeds/ packet. Triticum aestivum Now rare, this variety was developed in 1964 by the UK Plant Breeding Institute, it is grown for its tall straw for thatching and good quality grain for bread making. For autumn sowing. Donegal oats Avena strigosa, This is an Irish heritage cultivar. Also known as grey or black oats.It is a reliable crop from spring sowing on even the most marginal of land. It has been grown in Europe since the Bronze age. Black oats were the predominate type of oat sown in this area until the 'white' A. saliva was introduced in the 1920's. It has rather gone out of fashion in Ireland. It has potential as a cover crop or green manure, and is used for that purpose on millions of acres in Brazil. Sow directly in the ground in early spring. Harvest when the grain starts to harden and finish drying in bunches under cover. It his hulled so needs threshing and de-hulling before it can be cooked and eaten.